Cement which is stored in silos sometimes tends to agglomerate especially in silos which have only one central or lateral discharge spout or in silos which are located in humid climates. Occasionally parts of the agglomerated cement move with fresh cement – which flows smoothly – towards the discharge spout. At this bottleneck, these lumps plug up the discharge aperture causing discharge trouble. The cement flow is reduced or comes to a full stop. 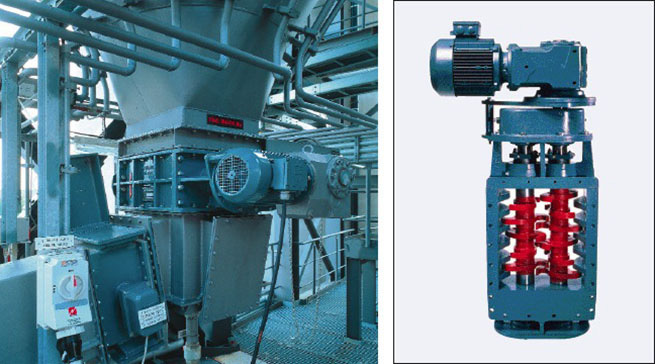 The lump crusher placed at the silo discharge disintegrates the lumps to a size which allows the cement to pass the aperture of the flow control gate trouble-free. The lump crusher has proven his ability for many years of service. The combination of lump crusher and IBAU Flow-control gate has shown no wear when inspected after one year of operation. It is advantageous that the cracked chunks can flow freely and unhindered through the IBAU Flow-control gate as the gasket is not an obstacle in the conveying stream. There are no sediments or turbulences in the stream of conveying goods which may affect the flow of cement and which consequently wear down the gasket.